A couple of retro-valentine print clutches and handmade tags. A great way to give some pretty postage stamps, baking chocolate, or whatever your friends like. And something for you too of course. A large square (appx. 17" x 19") of this sweet fabric so you can craft something all your own. Choosing one winner is fun, but choosing two is even better. For the second winner, a totally cheeky clutch in the "How To Catch a Husband" print. Perfect for your single friends, right? Sure, they'll speak to you again. Soon. 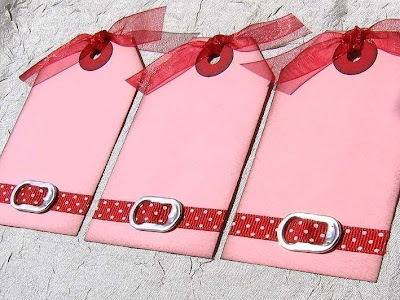 Some more pretty tags for giving, made by my artist friend who keeps me well stocked. And remember clutterpunk's thread sketching that I raved about here? I applied it to a little drawstring bag just for fun. Open to everybody (even if you've been a winner before), and overseas too though I'm not sure if mail will reach you outside N. America before the big day. Giveaway closes late Saturday January 23rd. Someone asked, so I'll be posting a tutorial teaching you how to make the clutches after the giveaway. Wonderful items. Love the vintage look!! What a bunch of cute prints!!! I bet you had lots of fun making those. What a swell giveaway! (Did that sound retro?) I love all your little pouches! So Dang cute!!!!!! I love the retro and I love the flip top can lids on the tags. Great ideas! Love the fabric!! I remember getting valentines that looked like that when I was in school. Valentine's Day is my FAVORITE -- and I have a collection of vintage Valentines. I am in love with that fabric!! These are SO cute! Great inspiration and I would love to win these! Your fabric choices are amazing! And I don't know if my email address will show up so it's xanthippe2005@hotmail.com. Thanks!! Oh, gosh, these are gorgeous. Thanks so much for offering. That is just the cutest fabric. Thanks for the chance to win, it's very generous of you. Oh, I love, love love! The vintage prints is SO cute - awesome giveaway!! Help! I don't know which prize to hope for! Seriously, thanks so much for all your giveaways! Oh fun! I can't wait for you to do the tutorial! These are WAY too adorable! Even if I happen to win something (fingers and toes crossed) I am looking forward to the tutorial!! Good luck everyone! ooooh, LOVE the fabric!!!! I'm trying to bust my stash right now, or I'd be ordering my won right now... fingers crossed that I win it! own, not won.... sorry, typos bug me, especially my own. Oh, this is such a sweet giveaway! Please count me in and please do post the tutorial for the clutches, I would love to make one. Thanks! I would love to be entered into to the contest! Cute things! I'll have to think of something fun, but I know I could come up with it. Thanks for the giveaway - vintage valentines always thrill me . . didn't know such a fabric existed! I would love to be entered into the giveaway! Thanks! And all this time I thought I should be using duct tape and rope to catch a husband--silly me! Happy V Day to you in advance to - what a lovely idea. Oh my goodness! Everything is so stinkin cute!! What a fun giveaway! How fun!! I can't wait for the tutorial!! PS my items came today - thank you!! Oh I can't wait to win the "catch a husband print" for my sister! Vintage chic....vintage fun! Would love to join in the fun. oh my gosh, these are beautifuf! What a sweet idea, to acknowledge your mommy friends on V-day! I always think about something like that at Thanksgiving, but am usually too busy prepping for Christmas to do much about it. I just found your blog and I am loving it. Hoping my remodeling life calms down enough here soon to start sewing again....Thanks for the inspiration! Way cute blog I'm a total newbie to sewing!!! i love it so far!!! your stuff is toooo cute! I bumped into your blog from another; I can't remember which one and you are so creative! Thanks for the chance! I love the Valentine's fabric! So cute and cheeky, too! It reminds me that I have some small pieces of Valentine's fabric floating around here that I should certainly do something with soon.